﻿Working to support our parish and local community by organizing opportunities to help those in need while also offering parish-wide events for our community to share in fellowship, faith, food and fun! You may sign up for the Family2Family email newsletter by clicking the button below. By signing up, you will receive newsletters with information and updates on our programs and event, with chances to sign-up to help out. Stamp Out Hunger is a nation-wide food drive that collects non-perishable food through the USPS. Locally, the food collected is delivered to House of Hope (HOH) food pantries. The massive amount of donations is brought to the fairgrounds in Stuart and sorted for HOH food banks. HOH manages the sorting at the fairgrounds by asking for volunteers to help for 3 hour shifts at a time. This year the event is on Saturday, May 11th. Family 2 Family is hoping to fill 20-25 volunteer spots in the 5-8pm shift on May 11. If you would like to be one of these volunteers, please click HERE to sign-up. The work involved is not heavy lifting, but requires standing and will keep you fairly active due to constant deliveries of pallets of donations. Closed toed shoes are a MUST! We hope that all volunteers wear their F2F t-shirt, to help evangelize and spread the spirit of the Holy Redeemer Church family. If you do not yet have a shirt and would like to buy one, please email Amy at outreach@holyredeemercc.org. Children ages 12 and up are welcome to help but must be with a parent/guardian. We are excited for a Family2Family volunteer team to again be part of this important program, which brings much needed food and supplies to Martin County food pantries. INTRODUCING... our Family 2 Family T-shirt!! 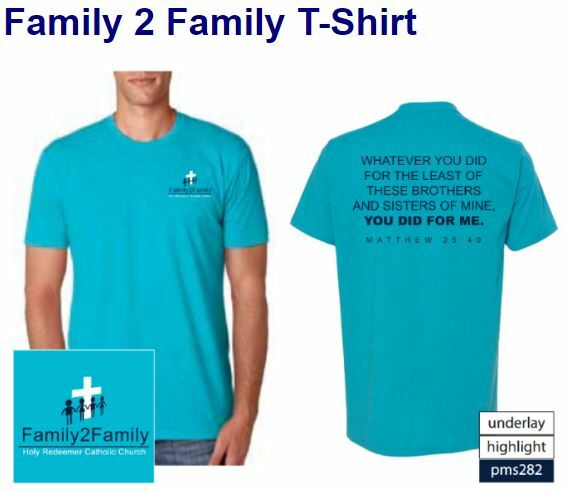 If you would like to purchase a shirt to wear anytime you are volunteering on behalf of our parish family (or just whenever you want to wear a comfortable t-shirt!) - click the button below for a link to the order form!